Cabeza de Vaca's La Relación online at the Southwestern Writers Collection (Texas State) includes the text of the narrative, information on and pictures of various editions, articles on Cabeza de Vaca's route and other topics (mostly in .pdf format) ,and teaching materials for K-12 teachers. 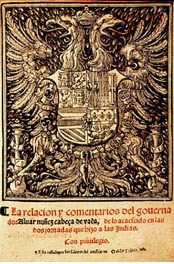 Cabeza de Vaca. A well-annotated explanatory site with many images. Cover page image of La relacion y comentarios del governador Alvar Nuñez Cabeça deVaca, de lo acaescido en las dos jornadas que hizo a las Indias courtesy of the Cabeza de Vaca exhibit at the University of Pennsylvania.